Here’s the pitch: Faced with the possibility of the gas chamber while doing time in San Quentin, Danny Trejo turns his life around and becomes an actor, with an unprecedented career in both television and film. In 2010 he achieves iconic status playing the first Chicano superhero on the American film screen, the title role in Robert Rodriguez’s Machete. Hard to believe? A drug addict, Trejo was “state raised,” first being sent off to Juvenile Detention Center, followed by the California Youth Authority, and finally to prison. Trejo recalls that the turning point in his life came in 1968. It was Cinco de Mayo in San Quentin. He and a couple of other inmates decided to incite a riot and he was sure they were on their way to the gas chamber as a result. Trejo remembers praying, “Diosito, if you’re there, it’s going to be all right. If you’re not, then we’re screwed.” As he faced his mortality, he recalled what he had been told all his life, but refused to believe: “You are a born leader. You have so much potential and with your charisma, you could do so much with your life.” Trejo recalls: “And here I was, on my way to the gas chamber with all my charisma.” For the first time in his life he chose to believe in himself. But he also realized that if he was going to turn his life around, he needed to give up drugs and alcohol. Strangely enough, it was with the help of his “mentor” Gilbert. They both quit. By 1984, Trejo found himself embarking on a new career. While working as an extra on the set of the film Runaway Train, he bumped into Edward Bunker, the screenwriter of the film and a person he had done time with in San Quentin. Bunker remembered Trejo’s boxing skills and offered him $320 a day to train Eric Roberts, one of the movie’s stars. From that moment forward, Trejo became the go-to-guy to play the gang member, the drug dealer, or prison inmate. Directors often asked him to take off his shirt because they liked his chest tattoo (a beautiful Latina wearing a sombrero), which is seen in nearly all his movies. “I was often asked ‘Aren’t you afraid of being stereotyped?’” he chuckles. “And I looked at them and asked, ‘As what?’ ‘Well as the mean looking Chicano dude with tattoos.’ And, I’d say, ‘well I am a mean looking Chicano dude with tattoos.’” It’s become his calling card and he uses it wisely. Trejo has worked alongside some of Hollywood’s top actors, including Jean-Claude Van Damme, Johnny Depp, Al Pacino, Charles Bronson, George Clooney, Robert De Niro, Harrison Ford, and Antonio Banderas. But it was meeting director Robert Rodriguez in 1995 while auditioning for Desperado that would set Trejo on the road to superstardom. “I walked in [to the audition] and he said, ‘you remind me of the bad guys in my high school.’ And I said, ‘I am the bad boys in your high school!’ We hit it off and we just kind of hung out together.” While filming Desperado, they discovered they were second cousins. As is the case for all of Rodriguez’s films, the budget for Machete was modest, about $10 million (low by Hollywood standards.) In its opening four-day weekend release it earned $14,102,888, already making back its investment. The film has gone on to gross over $26 million in the U.S and $39 million worldwide, making it a bona fide box office hit and elevating Trejo to the Hollywood superhero club. Trejo has worked on over two hundred films to date, eight of those with Robert Rodriguez including the Spy Kids franchise, Desperado,and From Dusk Till Dawn. Trejo is constantly working and has been known to sometimes work in five or more movies per year in various genres. But he is not above helping out independent filmmakers, many of them Latinos. “For me, helping these young up and coming filmmakers, it’s not about the money. I do what I can to help them out.” Trejo explains why it’s important to work with them: “I still try to do four or five student films per year. You have to. You have to remember the joy and passion of a new filmmaker who has his first $100,000 and the passion that he or she brings. It’s so unbelievable to watch and nurture them.” And having a name like Danny Trejo attached to your independent film could mean the difference between securing the money to get your film project made or just become just another of the thousands of scripts each year that never see the light of day. This year alone, Trejo has twenty-one films in various stages of production. He recently finished the indie film Vengeance, directed by Gil Medina. Spy Kids 4 is set to release in August, and A Very Harold & Kumar Christmas is scheduled for a November. And he’s also joining the Muppets in the release of their film at the end of the year. 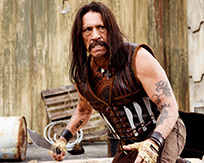 While fans wait anxiously for the return of Machete, which according to Trejo will most likely shoot in 2012, they can get turn on their TVs. It was recently announced that Trejo would star in a multi-episode arc in season four of FX’s Sons of Anarchy as (what else?) a former Mexican commando.